Is Nadal Vs Federer rivalry a thing of the past? 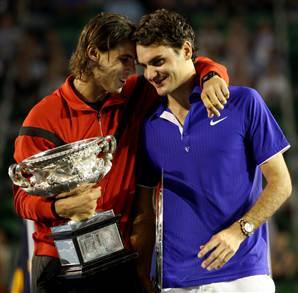 Few years back world tennis was all about Nadal and Federer. Even though there were others, none of them challenged the supremacy of these two greats and they remained the undisputed world number 1 and 2. In the last year or so, with the emergence of Novak Djokovic we can see there is a shift in the tide. Djokovic who won the Australian open championship this year has a perfect record of 24-0 in 2011 and is yet to be beaten on the tour this year. He has already displaced Federer at the number 2 spot as has constantly beaten Nadal in their recent encounters. The recent win in Miami against Nadal further confirms his rise to supremacy. The year 2011 has just begun and it is already promising to be a great year for tennis fan. With the rise of Djokovic the battle to the top is now a three way thing and I feel that the Federer Vs Nadal rivalry is now thing of the past. Nadal also has been dominating Federer in their recent meetings. So I guess the rivalry between Djokovic and Nadal has more weight in the current scenario. Djokovic is now the man to beat in tennis, both Nadal and Federer have found difficult to beat him in recent times. The Serbian in his recent interview has said that becoming the world number 1 is his ambition will want to begin the quest with the clay court season. Clay is a surface which has been a fortress of Rafael Nadal and a win there would almost confirm Djokovic as the next tennis great. So Federer and Nadal now have a battle in their hands and with players like Andy Murray and Del Potro also close to their heels, we might have a great 2011 ahead. The French open will be interesting as Djokovic would want to extend his supremacy on clay too. It will be interesting to see who will finish as the best player in the rankings at the end of this season. And for the first time in few years it will not be a battle just between Nadal and Federer, which is a good thing for men’s tennis.